Telecom Customer Care is a Blog which provides you the Basic information about telecommunication and Toll-Free Numbers and Contacts Information for Different Top Level Telecom companies. Hi, guys, are you looking for the idea of customer care number? Can not get helpline number? And many such questions have been answered on this article. Here we are providing you with good information about the idea of customer care number for both prepaid and postpaid customers. Using the idea, using helpline numbers, you can easily post your thoughts. We know that Idea is part of the Aditya Birla Group of Cellular Network Industry, the largest telecommunications network based on voice-based, data-based 2G, 3G, 4G / LTE services, broadband services, wireless communication, and much more. was doing. There are more than 100 million customers worldwide. Here you can find details of customer care number for both postpaid and prepaid customers. For inquiries about so many customer balances, voice/ data/queries, about the latest proposals to activate/deactivate services such as VAS, caller tunes, DND, want to call customer care due to some problems/questions. The message offers, and more information about you about complaints, you can talk to the Customer Care Executive to resolve your problem. 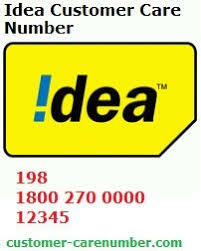 Here you can get the customer care number of the idea network. Andhra Pradesh Idea Cellular Ltd, 3rd floor, K.L.K Estate, Fateh Maidan Road, Basheer Bagh, Hyderabad – 500001. Assam Idea Cellular Ltd, F Fort, 5th Floor, Kachari Basti, Ulubari, GS Road, Guwahati – 781007. Bihar Idea Cellular Ltd. 1st Floor, (Above ICICI Bank), Sumitra Sadan, Boring Road crossing, Patna -800001. Gujarat Idea Cellular Ltd, 2nd floor, Venus Atlantis, 100ft Road, Prahalad Nagar, Ahmedabad – 380015. Haryana Idea Cellular Ltd, Anantraj Tech Park, 5thfloor, Plot No-1, Sector-22, Panchkula – 134116. Madhya Pradesh Idea Cellular Ltd, 139-140, Electronic Complex, Pardesipura, Indore, MP – 452010. Kerala Idea Cellular Ltd, VJ Tower, Vyttila PO, Kochi, Kerala -682015. Delhi Idea Cellular Ltd, A-68, Sector-64, Noida -201301. Himachal Pradesh Idea Cellular Ltd, Keonthal complex, Khalini, Shimla, H.P -171002. Jammu Kashmir Idea Cellular Ltd, 3rd floor, Sunny Square, Gangyal, Jammu -180010. Karnataka Idea Cellular Ltd, 75, Civil Station, Richmond Road, Bangalore – 560025. Kolkata Idea Cellular Ltd, Srijan Tech Park, 7thfloor, DN-52, Sec-5, Salt Lake, Kolkata -700091. Maharashtra & Goa Idea Cellular Ltd, Sharada Centre, 11/1 Erandwane off Karve Road, Pune – 411004. Mumbai Idea Cellular Ltd, 3rd Floor, Windsor, Off CST Road Kalina, Santacruz East, Mumbai – 400098. North East Idea Cellular Ltd, F Fort, 5th Floor, Kachari Basti, Ulubari, GS Road, Guwahati – 781007. Orissa / Odisha Idea Cellular Ltd, Plot No 437, Ground Floor, Patia, Chandrashekarpur, Bhubaneswar, Odisha – 751024. Punjab Idea Cellular Ltd, C 105, Industrial Area, Phase VII, Mohali – 16005, Punjab. Rajasthan Idea Cellular Ltd, 1-2 Jai Jawan Colony, Ton Road, Jaipur, Rajasthan – 302018. Tamilnadu Idea Cellular Ltd, PSA fort, Plot Number A1, A2 & B, Nehru Nagar Main Road, Off Old Mahabalipuram Road, Perungudi, Chennai – 600096. UP East Idea Cellular Ltd, Fortuna Towers 10, Ratna Pratap Marg, Opp NBRI, Lucknow – 226001. UP West Idea Cellular Ltd, A-68, Sector-64, Near Sahara Electronics, Noida -201301. West Bengal Idea Cellular Ltd, Srijan Tech Park, 7thfloor, DN-52, Sec-5, Salt Lake, Kolkata -700091. If you find this information intresti please let us know in comment box below. @telecomcustomercare2018. Awesome Inc. theme. Powered by Blogger.